You’ve probably heard about Kona coffee in Hawaii. When you come to Hawaii, drinking a cup of Kona coffee is a must-do. But what exactly is Kona coffee, and why is it so different from other types of coffee? Kona coffee is the name of the coffee that grows on the volcanic lava rock slopes of Kona. The Kona coffee region is about 20 miles long. It runs along the southwest coast of the Big Island, and it is approximately two miles inland. There are many coffee farms in Kona that offer tours and coffee tastings, making Kona a tourist destination as well. At its widest, this region is no more than a mile wide. Early farmers realized that the well-drained volcanic soils and the unique weather combine to make this region an ideal place to grow coffee. Coffee is a delicate plant that doesn’t thrive when the weather is too hot or too dry. But it also cannot survive in cold weather. So, these plants love the weather in Kona. Coffee also thrives only at altitudes, above 500 feet. Coffee plants also need a lot of rain followed by a period of dryness. Kona is the perfect place to grow coffee because of these unique attributes. Champagne can only be grown in the Champagne region in France. Similarly, only coffee grown in this region can be described as Kona coffee. Hawaii is also the only US state to grow coffee commercially. I love to send Kona coffee to people back on the mainland as gifts, so I know that it also makes great souvenirs. Early farmers tried to grow sugar and other crops in the Kona area. But, they quickly learned coffee is the best crop to grow here. Kona is a small, remote area, and growing coffee presents a unique set of challenges. These factors combined to attract a unique type of farmers. These independent men and women enjoyed the peace of the Kona coast. They also preferred to work on a labor-intensive crop instead of on big plantations. The eventual success of growing Kona coffee was a result of both human and agricultural factors. The social factors that caused people to want to grow coffee in Kona were just as important as the agricultural factors that made Kona coffee so important to Hawaii. 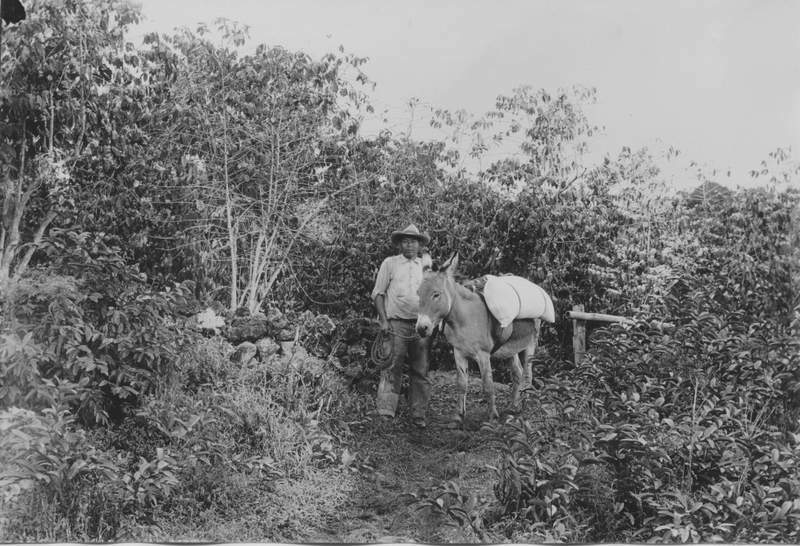 With the ability to carry heavy loads, donkeys, affectionately known as "Kona Nightingale," were an essential part of the coffee industry and carried most of the grower's crops across Kona's steep and rocky slopes. Pictured is Kona coffee farmer Masaichi Fukumitsu, c. 1934. The H.N. Greenwell Store Museum in Kealakekua will be displaying its award-winning exhibit, “The Kona Coffee Story: Along the Hawaii Belt Road” on Saturday, June 3 from 10 am to 2 pm. The Japanese American National Museum in Los Angeles and museums throughout the world have featured this exhibit. The H.N. Greenwell Store is the oldest surviving store in Kona and one of the oldest buildings in Hawaii. If you can’t be there on Saturday, the exhibit will also be open 10a.m.-2p.m. Mondays, Tuesdays, Thursdays and the first Saturday of every month. Admission is $5 for adults, free for students, military and Kona Historical Society members. With the introduction of coffee to Kona in 1828, the development of Kona’s world-famous coffee industry experienced its highs and lows. Voices of hard working coffee farmers and community leaders can be heard through personal accounts, historic photographs and artifacts featured in this exhibit, all of which tell the compelling story of the early days of Kona coffee. The exhibit includes rare family portraits, scenes from the coffee land during the early 20th century, and a miniature model of a hoshidana, a traditional coffee mill. For this special exhibition of “The Kona Coffee Story: Along the Hawaii Belt Road,” Kona Historical Society has incorporated never-before-seen photos and artifacts from the organization’s collections and archives. A product of extensive community collaboration led by the Kona Japanese Civic Association, Kona Historical Society and the Japanese American National Museum, the Society’s renewal of this world-traveled exhibit offers visitors the opportunity to be inspired by stories of Kona’s coffee pioneers and learn more about the deep roots of Kona’s coffee heritage and culture. Kona Historical Society also offers some educational programs throughout the year. Check out their calendar here. Make the Kona Historical Society one of your stops during your time in Kona as you try out Kona coffee at different coffee farms. You can book a Kona Culture & Coffee Tour that will bring you to the Pu‘uhonua O Hōnaunau National Historical Park, Kona coffee tasting and more! As an added bonus, you will see beautiful views all along the way. If you want to learn more about Kona coffee during your stay in Hawaii, call us today to book a Kona Culture and Coffee Tour.